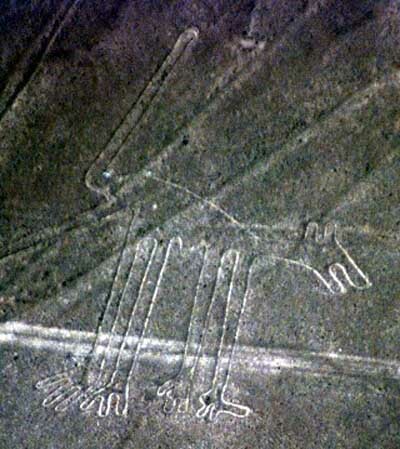 The Nazca Lines, mysterious geoglyphs that span a vast swath of the rugged Peruvian desert, remain an engima. No one has proof as to who built them and what their function was. 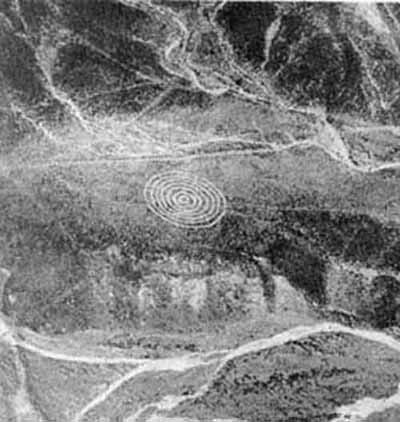 Since their discovery, the they have inspired fantastic explanations from ancient gods, a landing strip for returning aliens, a celestial calendar created by the ancient Nazca civilization -- putting the creation of the lines between 200 BC and 600 AD, used for rituals probably related to astronomy, to confirm the ayllus or clans who made up the population and to determine through ritual their economic functions held up by reciprocity and redistribution, or a map of underground water supplies. 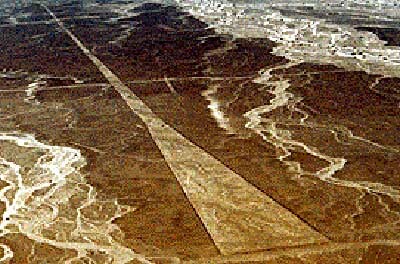 The Nazca plain is virtually unique for its ability to preserve the markings upon it, due to the combination of the climate (one of the driest on Earth, with only twenty minutes of rainfall per year) and the flat, stony ground which minimizes the effect of the wind at ground level. With no dust or sand to cover the plain, and little rain or wind to erode it, lines drawn here tend to stay drawn. These factors, combined with the existence of a lighter-colored subsoil beneath the desert crust, provide a vast writing pad that is ideally suited to the artist who wants to leave his mark for eternity. The pebbles which cover the surface of the desert contain ferrous oxide. The exposure of centuries has given them a dark patina. When the gravel is removed, they contrast with the color underneath. In this way the lines were drawn as furrows of a lighter color, even though in some cases they became prints. In other cases, the stones defining the lines and drawings form small lateral humps of different sizes. Some drawings, especially the early ones, were made by removing the stones and gravel from their contours and in this way the figures stood out in high relief. The concentration and juxtaposition of the lines and drawings leave no doubt that they required intensive long-term labor as is demonstrated by the stylistic continuity of the designs, which clearly correspond to the different stages of cultural changes. There appear to be various designs consisting of figures of animals, flowers and plants, objects, and anthropomorphic figures of colossal proportions made with well-defined lines. An example of this is the drawing of a weird being with two enormous hands, one normal and the other with only four fingers. Also represented are drawings of man-made objects such as yarn, looms and "tupus" (ornamental clasps). All these figures have well-defined entrances which could be used as paths or to allow people to line together along the conformations of the drawings. The anthropomorphic figures are relatively few and are situated on the slopes. The most well-known being is The Astronaut at 32m in length discovered by Maria Reiche in the 1960s. The newly revealed figures discovered by de la Torre are of a snake (approximately 196 feet in length), a bird, a camelid (perhaps a llama) and some zig-zag lines. They are actually on some hills in the El Ingenio Valley and Pampas de Jumana near the desert floor. Archeologists have been alerted to authenticate the find. Flower - Flower of Life? 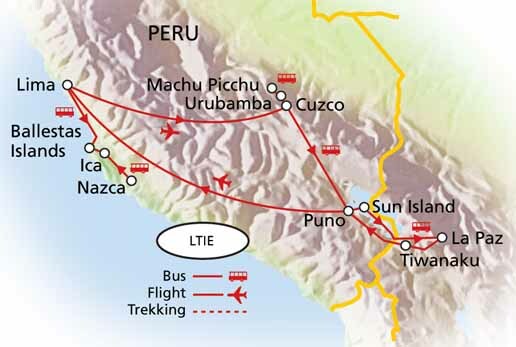 The Nazca Lines were first spotted when commercial airlines began flying across the Peruvian desert in the 1920's. Passengers reported seeing 'primitive landing strips' on the ground below. Today people sometimes fly in hot air balloons to view the splendors of the Nazca Lines, their eneries awakening something within their souls. In recent years the Nazca Lines have suffered gradual destruction, as tomb raiders seeking pre-Inca artifacts scar the terrain with hundreds of burrows, garbage, among other waste material. A boom in copper and gold mining - including a mine built in 1997 a few feet from a 2,000-year-old, two-mile-long trapezoid -- is defacing parts of the Nazca Lines with tracks from truck traffic. The damage to the Lines underscores Peru's desperate struggle to preserve its national patrimony. Archaeologists say they are watching helplessly as the quest for scholarship and conservation in a country viewed as the cradle of New World civilization is losing out to commercial interests, bleak poverty and the growing popularity of heritage sites as tourist attractions. Toribio Mejia Xespe, a Peruvian doctor and anthropologist was the first scientist, in 1927, to show interest in what he called "great Incan ceremonial artifacts". Erich von Daniken suggested, in his 1968 book, Chariots of the Gods, that the lines were built by ancient astronauts as a landing strip. But the soft clay soil and layer of brown and black rocks in the Nazca desert would seem an unsuitable site for landing and were blown away by the power of rocket propulsion. The aliens left - never to return - leaving the people confused. Like in the modern cargo cults they tried to call the Gods back by drawing lines, figures and trapezes. 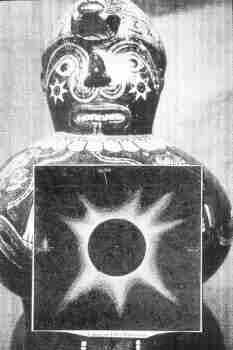 Robin Edgar believed that the Nazca Figures were inspired by, and intended to be seen by, the (so-called) Eye of God that is manifested during total solar eclipses. An extraordinary series of solar eclipses coincided with the construction of the Nasca lines. Some Lines are aligned with the winter solstice, a less spectacular but more regular, death and rebirth of the Sun God. 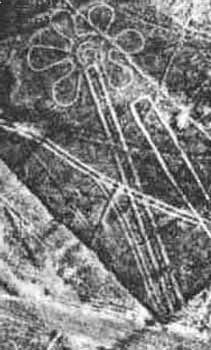 The Code of Carl Munck - The Ancient Geomatria of Numbers --The Nazca Line ground markings locate themselves on The Code Matrix system. 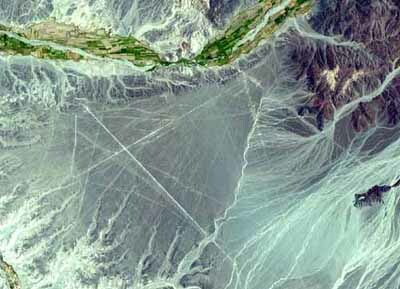 Nazca Lines and Archaeocryptography The ancient sites around the world are very precisely positioned on a global coordinate system in relation to the position of the Great Pyramid at Giza. The positions of the sites are given in the geometry of their construction. A very ancient system of numbers was used in the system, which we will call Gematria. Gematrian numbers are found in ancient myths and religions, including the Bible. Gematrian numbers were used in systems of weights and measures by ancient peoples, including the Greeks, the Egyptians, the Persians, the Babylonians and the Romans. The Code system uses mathematical constants, such as pi and the radian. The system also uses conventions that are still in use, such as the 360 degree circle, 60 minute degree, 60 second minute, the base-ten numbering system, the 12-inch foot, and the 5280-foot mile. Professor Gerald Hawkins and his group went to Nazca to prove the astronomical Theory of Maria Reiche but was unsuccessful. In 1968, a study by the National Geographic Society determined that, while some of the Nazca lines did point to the positions of the Sun, Moon and certain stars two thousand years ago, it was no more than could be expected by mere chance. In 1973, Dr Gerald Hawkins studied 186 lines with a computer program and found that only 20 per cent had any astronomical orientation - again no more than by pure chance. 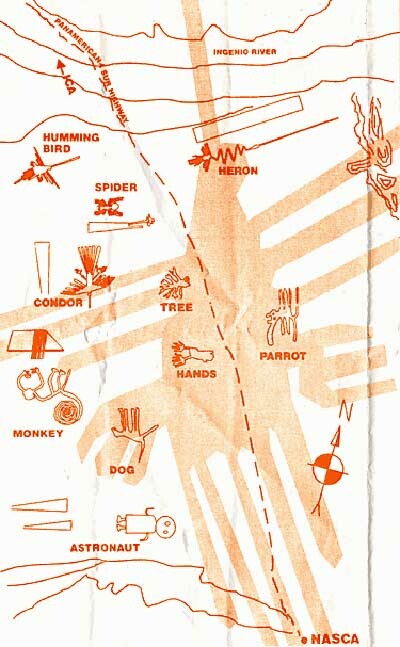 Markus Reindel's Dowsing Theory says that the Nazca Figures are markers for a subterranean waterflow. Trapezoides show the broadness of the waterstream, zigzaglines show where they end, lines show into direction of the puquitos. He explain the nature of the figures by rod-dowsing (to find the subterranean water) and shamanstic flights (to overview the figures). In the Early stage, these wares did not have much color, but Middle and Late Nazca polychromes are buff or red and are painted in three to eight colors. The most popular choices of color were red, black, white, brown, yellow, gray and violet with an outline in black. Bowls and beakers were common forms, but double-spout and head-and-spout jars are also found. 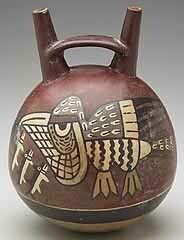 Birds, fish or fruits were commonly drawn on the pottery, and Nazca's religious or mythological features were also used in its design. Archaeologists have discovered more than 50 mysterious new 'Nazca lines' in Peru, which were constructed nearly 2,000 years ago by ancient inhabitants who painstakingly arranged pebbles into massive shapes. 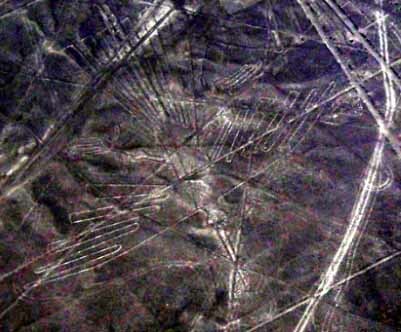 Some are hundreds of years older than the most famous Nazca lines previously discovered. 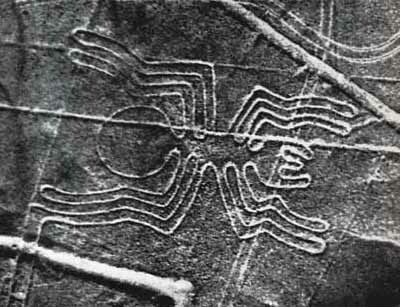 The researchers learned that while some of the geoglyphs were produced by Nazca people, others date back to a time before they lived in the region where the drawings can be found. 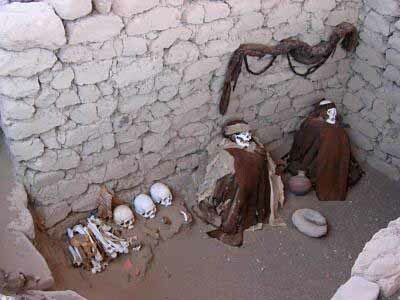 The Nazca people lived in the area from 200 to 700 CE. 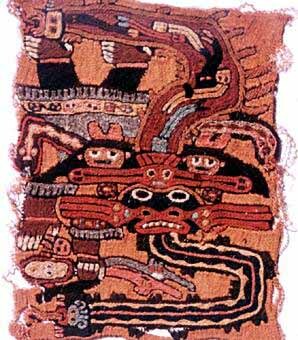 Some of the designs are believed to be created instead by the Topara and Paracas people. 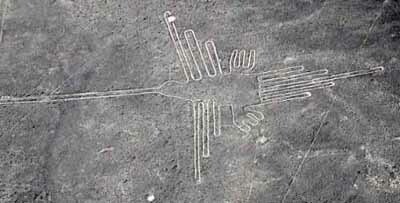 Peru's world renowned Nazca Lines were damaged when a rig plowed into the ancient site on Saturday, the country's ministry of culture said. Jainer Jesus Flores Vigo, 40, was arrested after he allegedly ignored warning signage and drove over UNESCO World Heritage site, the ministry said. Flores Vigo was released Monday after a magistrate said there was not enough evidence to prove that he had acted with intent, according to Peru's Attorney General Office. Dozens of circular geoglyphs, some comprising several intertwined rings, have been identified and mapped near the ancient Peruvian town of Quilcapampa, revealing that these earthen designs were created near ancient pathways used for trade. 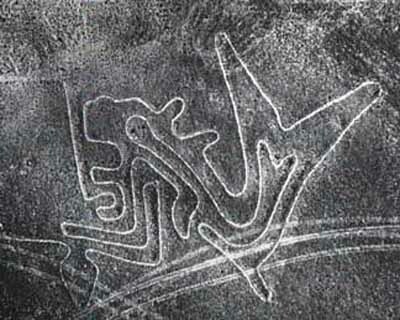 Geoglyphs are designs, which often form shapes or images, on the landscape. 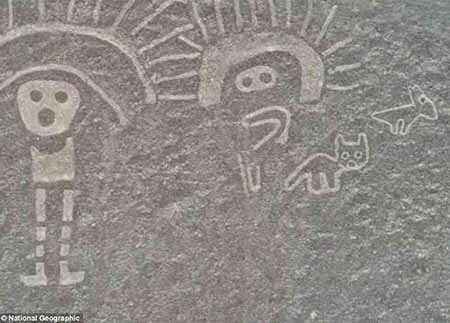 They are found all over the world; the most famous examples are located at Nazca, where thousands of such designs - from real and imaginary creatures to geometric shapes - have been etched into the Peruvian desert. The newly mapped geoglyphs may have had symbolic significance, possibly representing the flow of people and goods through the town at the time. A new Nazca geoglyph has been uncovered by Japanese scientists in Peru, and it could be linked to a major ceremonial center. Measuring 98-feet long, the geoglyph is located within the central area of the Nazca pampa, a large, flat, arid region of Peru between the Andes and the coast. The line drawing is of an animal, with many legs and spotted markings, sticking out its tongue. 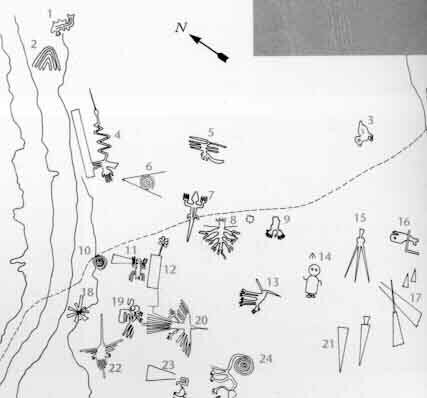 The animal drawing might be linked to the vast ceremonial center of Cahuachi, which contains about 40 mounds topped with adobe structures. 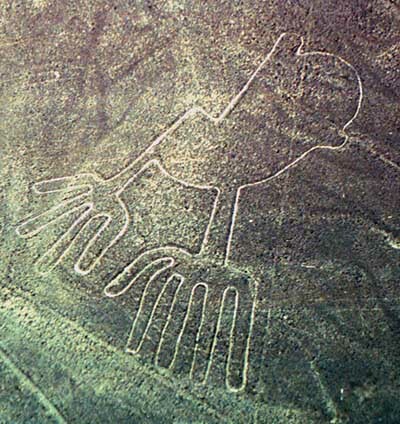 The desert area of Nazca is most famous for giant representations of humans, animals and plants - as well as 900 geometric shapes - carved into the ground: the so-called Nazca lines. But the lines are not the only artifacts of the Nazca civilization, which flourished in the area between 200 BC and 600 AD. The region also contains spiraling, rock-lined holes, known as puquios. Long understood to be a series of underground aqueducts, little else is known about them. By considering their positioning relative to water resources and to settlements, they were able to piece together a picture of just how extraordinarily advanced the puquio system was. The corkscrew-shaped tunnels, Lasaponara concluded, funneled wind into a series of underground canals, forcing water to places in the arid region where it was needed. 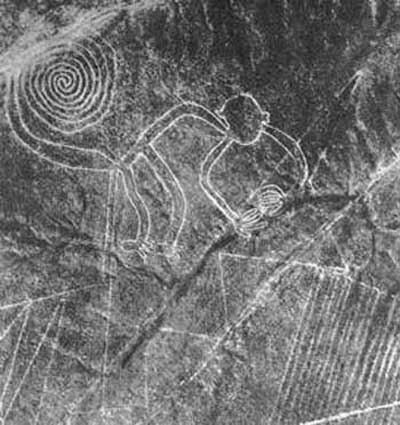 Some of the Nazca Lines, mysterious geoglyphs that span a vast swath of the rugged Peruvian desert, may have once been a labyrinth with a spiritual purpose, a new study suggests. 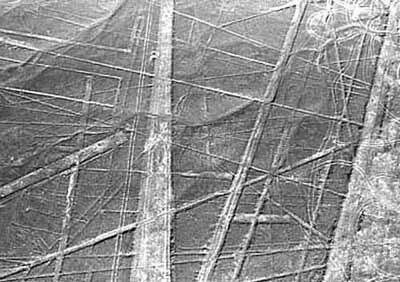 At the time the Nazca Lines, which span 85 square miles (220 square kilometers), were drawn, people were not looking at this stuff from the air, they were looking at stuff from the ground level. To appreciate what they might have meant to ordinary people, then you have to walk them. 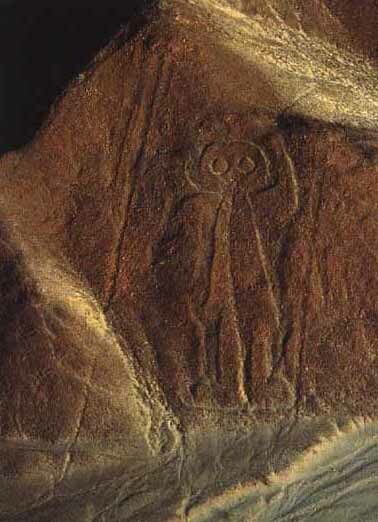 The ancient Nazca people of Peru are famous for the lines they drew in the desert depicting strange animal forms. A further mystery is what happened to this once great civilisation, which suddenly vanished 1,500 years ago. 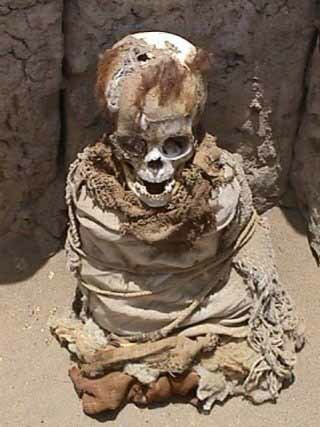 Now a team of archaeologists have found the demise of the Nazca society was linked in part to the fate of a tree. Analysing plant remains they reveal how the destruction of forests containing the huarango tree crossed a tipping point, causing ecological collapse. 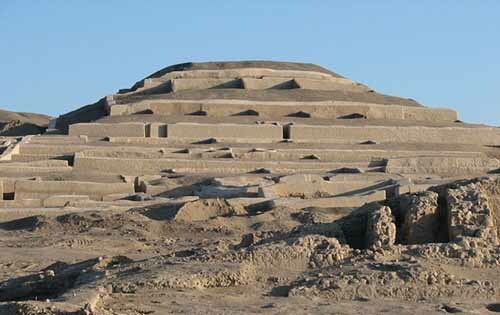 Archaeologists examining the remains of the Nasca, who once flourished in the valleys of south coastal Peru, have uncovered a sequence of human-induced events which led to their "catastrophic" collapse around 500 AD. The Nasca are probably best known for the famous "Nazca Lines", giant geoglyphs which they left etched into the surface of the vast, empty desert plain that lies between the Peruvian towns of Nazca and Palpa. 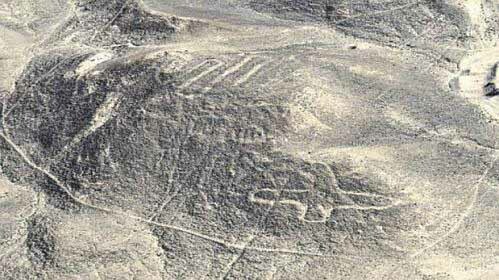 A group of about 50 drawings of giant figures recently discovered in the hills of Peru's southern coastal desert near the city of Palpa has been said to predate the famous Nazca lines nearby. Mr. Johny Isla, director of the Andean Institute of Archaeological Studies, said the 'geoglyph' figures appear to have been created by the Paracas communities between 500 and 400 BC, whereas the Nazca culture developed after 50 BC. Mr. Isla told The Epoch Times, "Most of these geoglyphs belong to the Nazca culture but our recent studies demonstrated that there are at least 50 geoglyphs pertaining to the Paracas culture. 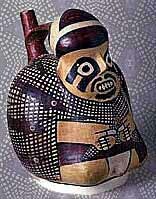 These new figures are definitely different and older than those of the Nazca culture. 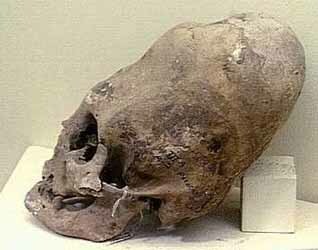 Finally, it is important to note that not one of the Paracas figures were repeated in the Nazca iconography."